I have to wonder how I managed to publish a post five days a week when now I get around to it about one a week if I’m lucky. Perhaps I’d stepped into a parallel dimension that gave me 42 hours in a day. That’s enough to sleep 10 hours like I enjoy. That’s enough to watch stupid TV shows I shouldn’t. That’s enough to even bother to work a full day. That has to be the answer. So while I was avoiding actually writing something, I flipped through the channels to find that Comedy Central was roasting Donald Trump. Come on. Why do they always pick such easy targets? Remember the David Hasselhoff one? This is like playing horse with a basket the size of Delaware. They should choose harder to roast subjects. How about Tom Hanks? I mean he did have that ridiculous hair in the DaVinci Code movies. I wonder if they put him on Lithium to dumb him down for that character too. But Tom is still too easy. 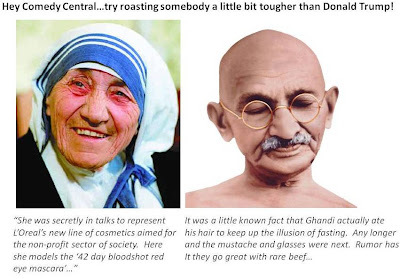 How about roasting Mother Theresa? 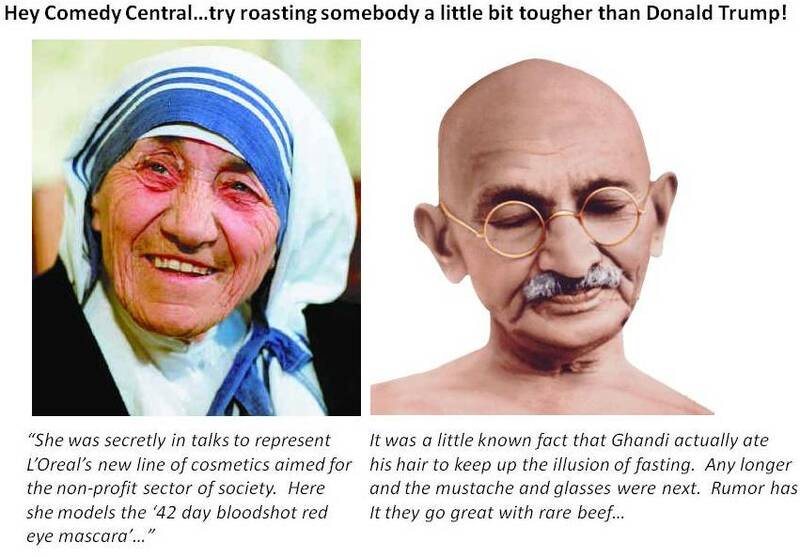 What about Ghandi? How about Jesus? Up the bar, Hollywood! Sheesh! I guess on the other end of the spectrum there are people so mean, despised or evil there’s just no fun in roasting them because they either welcome the abuse or they kill your entire family afterwards. But that’s a bit too extreme. If you scale back the crazy you find all these people that just piss you off. These are the people that despite all your nicety nice attitude and good Samaritan ways make you want to push them over that edge they’re leaning over. I wonder if they'll roast Charlie Sheen? I stopped watching telly years ago...really. I was a huge fan of the Dean Martin roasts, tho'...so...long...ago...! You're spot on, VE... why is it they always choose the easiest targets? BTW... 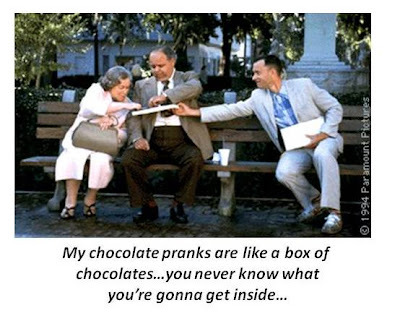 I'm never eating box chocolates again! Since they only tend to roast respected celebrities, I think we are in deep boxed-chocolates to find the next candidate. I saw the commercials for the Trump roast and figured that would be a good show to miss. And believe me, if you ever tried to roast Jesus in this country, you'd have burning crosses tossed on your lawn and probably even get a visit from the Westboro Lunatic Church (out of respect for Roger Williams and Dr. John Clarke, I refuse to label those genetically-damaged mouth-breathers "Baptists"). Christophe Hitchens wrote a piece in The Atlantic a few years back about how Mother Teresa was evil, so you aren't too far off. Remind me not to accept a chocolate from you... ever. kurt - I hate when people steal my ideas before I think of them! What were those laxatives called way back in the day? ADS or something like that. And no, I'm not thinking of Ex-Lax. Anyhoo, the ADS laxies were like candy! A box of special chocolates. If there's ever a VE roast, am I invited? I have to start getting all my crayon jokes ready. Well as long as you do not roast any of the Ayatollah's, then you should be safe. Roasting anyone else should be fairly safe. And I will take every box of chocolates that anyone gives me. I like surprises sometimes.